I watched the mens’ hockey game for the gold (Winter Olympics, Vancouver, 2010) at a friend’s house. It was the gold medal that helped Canada set the new world record for most gold medals at the Winter Olympics. 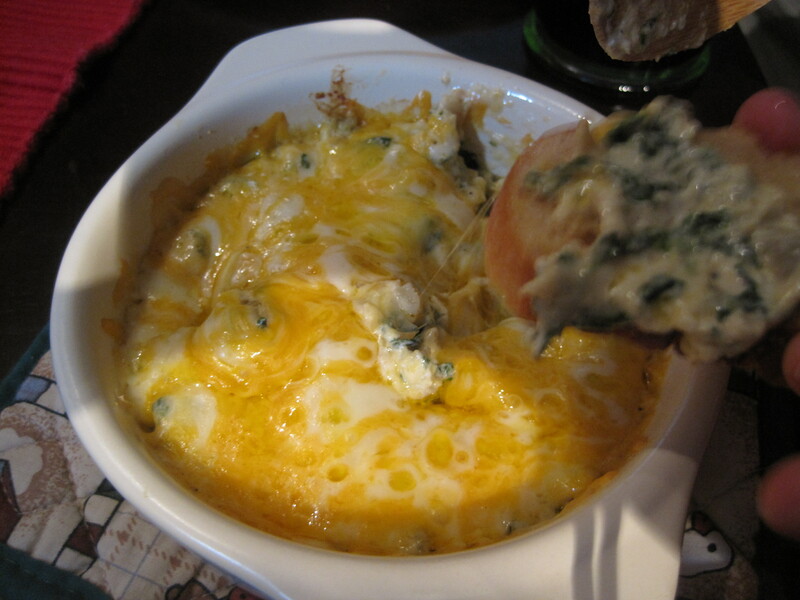 I made this baked cheesy spinach and artichoke dip and served it with thin slices of toasted baguette. I used my new brie baker for this. Preheat the oven to 350 degrees F. Put cream cheese, artichoke, spinach, parmesan cheese, mayonnaise, sour cream, garlic powder, onion powder, black pepper, and paprika in a bowl. Mix very well to combine. Transfer to a small baking dish or ramekin. Bake covered until heated through and cheese is bubbly, about 25 minutes (35 minutes if chilled). Serve warm with nacho chips, toasted baguette slices, or pita chips. Note that this can be prepared one day in advance, stored covered in the refrigerator.